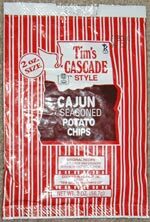 Taste test: Like all Tim's chips, these are exceptionally thick and crunchy. The cajun chips are quite hot — eat enough, and it will bring tears to your eyes. They's a hot aftertaste that lingers.